Meal planning, for me, is about balance. I eat everything… but in moderation. My mother had high blood pressure, so I learned early on how to forgo salt for other alternative spices. Heart healthy grains and low in fat are two other lessons that were reinforced throughout youth. If you haven’t noticed by now, I enjoy eating light and healthy without sacrificing the delicious. So what’s a birdloaf? 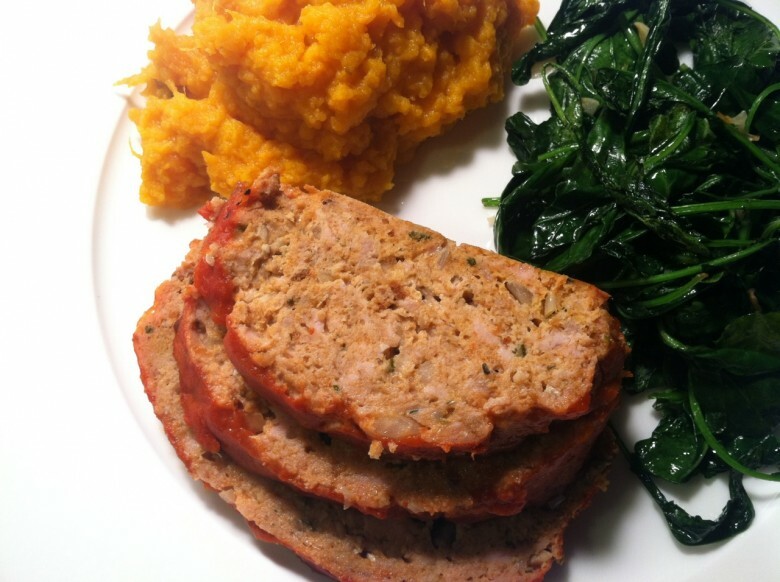 It’s a lighter, healthier “meat” loaf made with ground chicken and turkey instead of beef (or other red meats), whole wheat breadcrumbs, and a red sauce. No additional salt necessary because bottled ketchup is both salty and sweet. Preheat oven to 350. Place all of the ingredients, except the tomato sauce, together in a large bowl and mash with clean hands until all of the ingredients are mixed. Note: kids love this part. Form the mixture into a log in the center of a 9×12 inch baking dish. Cook for 1 hour. The sweet potatoes are simple. Wash the potatoes well and place into a pot of water covering the potatoes. Boil until a fork easily pierces into the middle of the potato. Remove from heat, strain hot water, and rinse the pot to use again. Under cold running water, remove the skins and place potatoes aside. Place the pot back on the stove over medium heat and add 1 tbsp of butter, shallot and sage. Stir frequently allowing the shallot to sweat and the sage to wilt. Try not to let the butter burn, keep heat low. After about 2 minutes kill the heat, add the potatoes and milk and smash together with a potato masher until the desired consistency has been reached. I like mine a little lumpy. Last step for the potatoes -squeeze in the orange juice, and stir together with a fork. I served the meal with baby kale, sauteed simply until slightly wilted with sliced garlic and olive oil. Gluten Free? make your own breadcrumbs with GF bread. 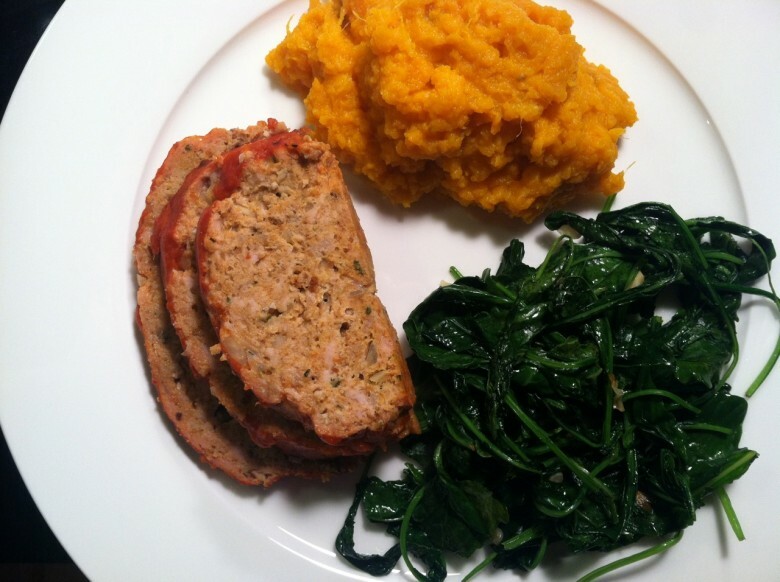 March 12, 2012 | Filed under dinner, gluten free and tagged with baby kale, chicken, dinner, easy, healthy, kid friendly, mashed sweet potatoes, meatloaf, sweet potatoes, turkey.